Our product updates come from talking with General Contractors, Superintendents, PMs, PEs, Foremen, and anyone else who needs to capture information in the field and communicate it to the office. For the Raken April product update, we listened to these clients and are introducing two new features they have been asking for. The Raken Super Daily now has customizable survey questions for subcontractors. You can upload and edit time card worker and cost code information by project instead of company-wide. 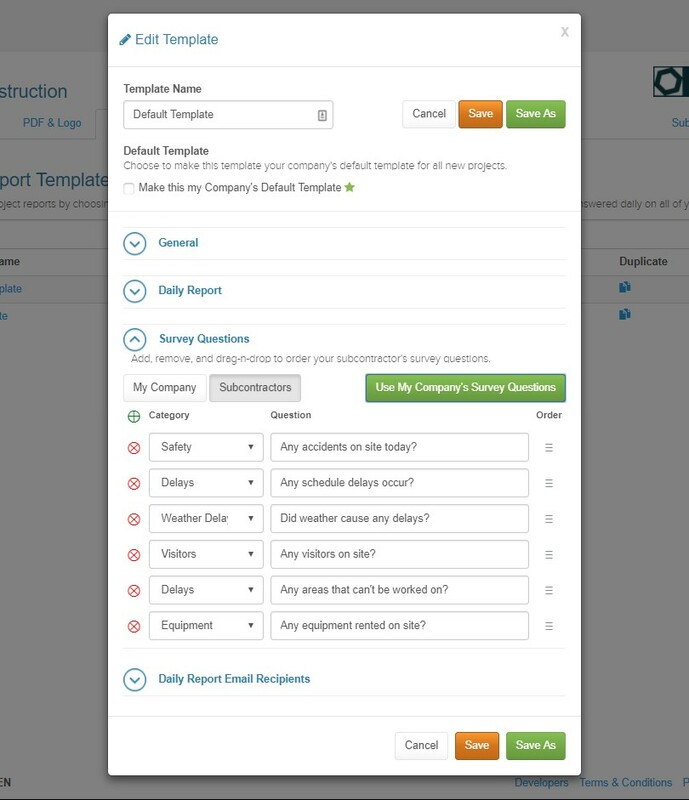 Performance users utilizing the Super Daily can customize the survey questions for their subcontractors to include in their daily report. Go to settings, then click survey questions. You will now see two buttons, select subcontractor. You'll see that by default a subcontractor gets the default survey questions. Now you can add to or edit those questions on a per-project basis. All changes are only applied to the project you are editing, but you can also create a template for subcontractor surveys. Import your existing company-wide questions and then edit for all your subs, or come up with an entirely new set. Adding questions to subcontractor surveys doesn't automatically delete the questions that sub already had, it simply adds more questions. Once created, subcontractors can't modify a question created by the General Contractor. In our first version of Time Cards, workers and cost code information was shared by the entire company. Now you can upload that information and edit it in specific projects. To upload and edit cost codes and workers for a project, navigate to project settings, then time cards. You will now see the ability to upload cost code and worker sheets that will apply only to the project you are editing. Customizing survey questions is by far the most requested feature from all of our clients using Super Daily. Giving the General Contractor the ability to customize the survey questions for their subs allows them to get the required information on a daily basis much faster. Many Raken customers have thousands of cost codes and hundreds of workers. Sifting through all those codes and people was causing friction. That's why we decided to create project-level controls for Raken Time Cards. Now, you can only upload workers and cost codes specific to your projects. This makes it easier to search and select workers and cost codes on both web and mobile app. It also speeds up entering time in the field. When a Superintendent goes into the project, he can now upload cost codes and workers to just the project in question. When he adds cost codes or workers in the field on a mobile device, those changes are applied to the current project rather than the company as a whole. The Raken April product update should interest two types of users. Customizing subcontractor questions is for performance users working on large projects with Super Daily functionality. Any users with Raken Time Card access will see the changes to their time card functions.